The problem with geothermal is quite simple. It is the oil business without the flush production that immediately recaptures your capital. What is described here is totally predictable and the only way to advance the technology. What it really means though is that long after the last drop of oil is pumped, Schlumberger and Halliburton will still be fracing geothermal wells. That often can and in this case will cost as much as the original well cost. Look at how hot those rocks are at merely 6000 feet. In today’s world that is almost shallow drilling. Hydraulic fracturing combined with a fracing sand that can help keep the fractures open should create a huge pool of accessible heat. Getting water back into the heat pool is a necessity. That is why we are still learning. The Basin and Range region has a vast reservoir of shallow hot rocks. These are plausibly remnants of the super volcano forming Yellowstone passing through. University of Utah researchers will inject cool water and pressurized water into a "dry" geothermal well during a five-year, $10.2 million study aimed at boosting the productivity of geothermal power plants and making them feasible nationwide. "Using these techniques to increase pathways in the rock for hot water and steam would increase availability of geothermal energy across the country," says geologist Ray Levey, director of the Energy and Geoscience Institute (EGI), which is part of the university's College of Engineering. EGI geologist Joe Moore - who will head the research effort at U.S. Geothermal Inc.'s Raft River power plant in southeast Idaho - says most geothermal power in the United States now is produced west of the Rocky Mountains, where hot rocks are found closest to the surface. "Hot rock is present across the United States, but new methods have to be developed to use the heat in these rocks to produce geothermal power," says Moore. "We want to use oil and gas industry techniques to create pathways in the rock so that we can use the heat in the rocks to generate electricity." "There's incredible potential in Utah and other states for geothermal development," he adds. "Engineered geothermal systems [in which water is injected to enhance natural cracks in the rock] could provide a means of developing these resources much faster." The U.S. Department of Energy on Sept. 4 signed an agreement with the University of Utah and EGI to pay almost $7.4 million of the project's cost. The University of Utah is providing $1.1 million through the Office of the Vice President for Research. Another $1.7 million will be provided by discounts or cash or in-kind donations by two of EGI's partners in the project: U.S. Geothermal, Inc. of Boise, and Apex HiPoint, LLC, of Littleton, Colo.
Moore says the university's contribution will help fund involvement of graduate and undergraduate students from the College of Engineering and College of Mines and Earth Sciences. "We're going to take a geothermal field and improve its productivity," Moore says. "We're going to test the techniques on one well at Raft River. We're testing methods to take wells that are not productive and make them productive." Moore says the Department of Energy did geothermal research for three decades at the site, located 11 miles from Interstate 84 in southeast Idaho halfway between Boise and Salt Lake City. Raft River is now a U.S. Geothermal power plant producing 10.5 to 11.5 megawatts of electricity - enough for roughly 10,000 homes. The power is sold to Idaho Power Co. Some estimate the site may be capable of producing 110 megawatts of power. Researchers believe production can be increased because underground temperatures measure 275 to 300 degrees Fahrenheit at depths of 4,500 to 6,000 feet. The Raft River plant currently has five "production" wells that produce geothermal energy and four "injection" wells where water from the production wells is returned to the underground geothermal reservoir. Water must be re-injected to maintain pressure in a geothermal power system. One well drilled in recent years did not produce enough hot water to be used as a production well because it did not connect with enough of the underground cracks that carry the hot water. "Geothermal wells are like oil wells - some wells produce and some don't," Moore says. "Drilling wells is expensive. That is why we need to develop low-cost techniques to improve their productivity." If the experiments run by EGI work, U.S. Geothermal eventually will operate the test well and put it into service. To produce geothermal power, hot rock is not enough. The rock also must be permeable to the flow of water and-or steam, says John McLennan, an engineer at EGI. Many geothermal reservoirs have heat, but the rock is impermeable, which is the problem at the Raft River well known as RRG-9. The experiment will try to make RRG-9 into an effective injection well because U.S. Geothermal must inject more water into the ground to increase the productivity of its existing production wells. Moore says all the water-injection "stimulations" will be done during 2010, with the well monitored over the rest of the five-year study period. All the water will come from production wells, not from streams. Researchers will first let cold water flow into the hot rocks around the 6,000-foot-deep well, hoping to crack them extensively, and then pump water into the ground under high pressures to force the cracks to open wider. 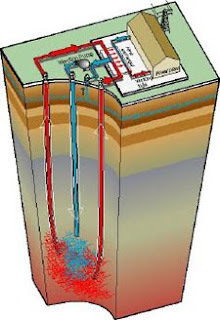 The goal of this "hydraulic stimulation" is to create a network of underground conduits that connect the well with underground cracks that already carry hot water. "When the cold water reaches the hot rock it will crackle," Moore says. "Stimulation is the process of generating new cracks." Apex Petroleum Engineering, Inc. of Englewood, Colo., will help design the water injection operations to create "hydraulic fractures." Apex HiPoint's monitoring equipment will listen to microseismic activity in the rural area to determine the extent of the cracking and thus the growth of the underground geothermal reservoir. Groundwater flow and pressures will be monitored. Moore says three "stimulations" will occur. During the first two, relatively cool water (40 to 135 degrees Fahrenheit) will flow into the well to crack the rock at a depth of 6,000 feet. Then, a third "stimulation" will involve pumping large volumes of water into the well at high pressure to expand the cracks and keep them open to the flow of water and steam. The lower half of the well is uncased by piping. The researchers will insert more piping so that the injected water will flow to the depths where it is needed. McLennan says semi-sized trucks carrying large pumps will come to the well site and may pump as much as 4,200 gallons of water per minute into the ground during each "stimulation." The total amount injected "could be on the order of 1 million gallons" for each of three "stimulations," he adds. The goal, says Moore, is "to create a complex fracture network over an extensive area." The Department of Energy wants to develop methods that can "stimulate" geothermal production in various geological environments with various rock types, Moore says. If the techniques used at Raft River prove effective, they could be used anywhere rock is hot. "It will definitely be an advantage to Raft River if they can improve the productivity of the well, but the Department of Energy is funding this as a research program because hot rock exists everywhere," Moore says. The Energy and Geoscience Institute is a contract research organization. Levey says that in terms of the number of participating companies, EGI is the largest university-based research consortium working with the energy exploration and production industry. In addition to their positions at EGI, Levey and Moore are research professors of civil and environmental engineering at the University of Utah, and McLennan is a research professor of chemical engineering and civil and environmental engineering.